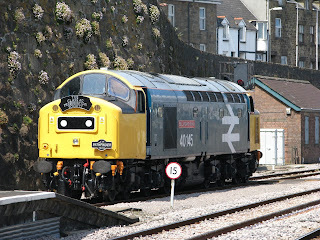 To give you a quick snap of the rally tomorrow is this footage of LFJ 844W on a run from the Torpoint Ferry. Also here is a video of newly arrived K804 ORL. I will leave my post for the Plymouth rally for tomorrow, though I can just say that I have absolutely loved today's rally and can't wait for tomorrow to do it all again except its BIGGER! Though tonights post is on my journey home. On the way back I had 32760 which had quite literally just come back from Plymouth after being fixed, with driver Jamie Limb at the helm. Things were going quite well and 60 was preforming better than most of the Tridents seem to these days. Though on reaching the junction at Tregantle Fort Jamie swung the wheel to left left, there was a loud THUD and the bus dived to the right!!! Luckily this was at a low speed so nothing bad happened. But if it had been just a few more minutes then the results could have been catasptrophic going along Witsand Bay. After a minute or two of letting the bus settle the wheels did decide to change direction so that Jamie could pull her in to the layby at Tregantle. 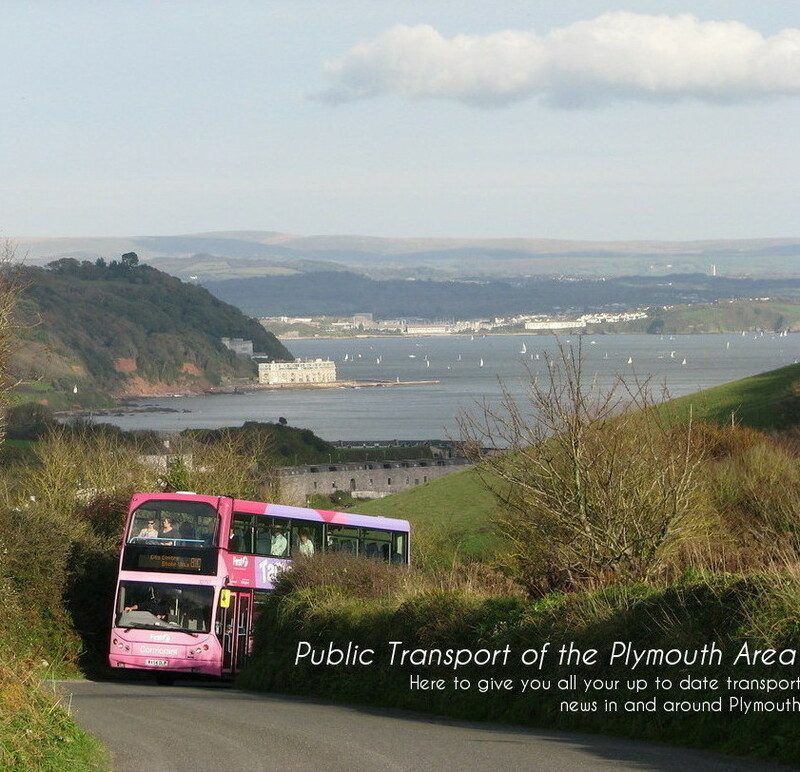 After a call to Engineering at Plymouth, the result was that that there were no spare buses avalible at Torpoint (should have kept C412!) 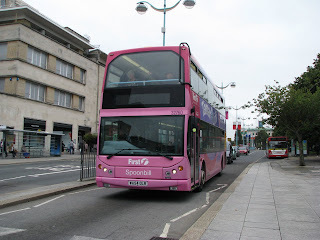 and that a bus would have to come out from Plymouth to replace the Trident, likely to be the bus that will soon replace C413 HJN, K801 ORL, though this would be a good 1hr and 30mins away at least. 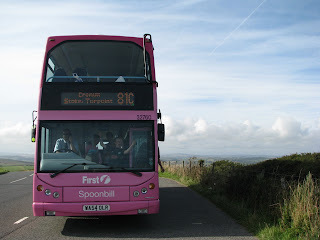 Therefore it was quicker to wait for the 81C behind, this being Steve around 40minutes behind us. We therefore boarded her to continue the journey. But it is funny to think that I've been riding round on a load of lovely old buses all day, some as old as 50, without any problems at all! Yet a modern Dennis Trident is the thing that let me down! Today was my first trip aboard the newest addition to the Torpoint Fleet! 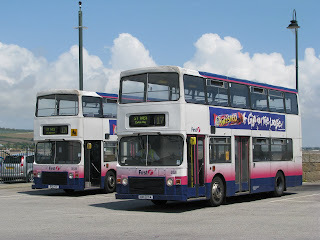 She arrived only a couple of days ago in place of my favorite Leyland Olympian C412 HJN, which has now been taken away from Torpoint and stored. K804 ORL is a very pleasant bus to be on. I would nearly say a fit replacement but thats just slightly over the top. They are lovely, very powerful throaty beasts, but nothing will match with the Olympians have in the last 4-5 years they have been working at Torpoint. This leaves just C413 HJN to go. 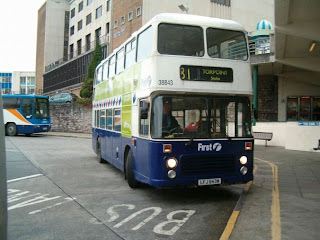 The last Leyland Olympian in use in Plymouth, and has become quite the old lady of Plymouth. They really have started to stand out in the city much like the VRs did 4 years previous. You always knew something special was coming when you could hear that Gardner roar! This also beckons the end of the era for the Gardner engine, C413 HJN now the last to be using the engine in the city. Today saw the Class 43 New Measurement Train visit the South West mainline. Leading was 43062 named John Armitt. 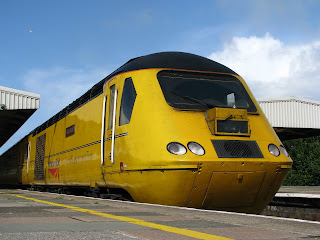 Both ends on this train were still fitted with Valenta engines though one of the 3 units used is now fitted with MTUs. This therefore may bekon the end for the Valentas in these and they are certainly becoming thin on the ground! This time of one of the few remaining Mercedes 709s, this being N289 PDV still seen in her old livery! View the video for more info. Three new videos are now avalible on my youtube. 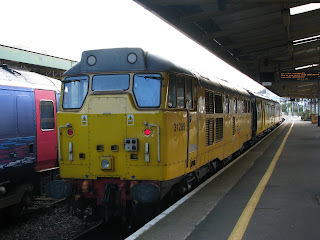 This class 31 measuring train, 31285, has been down in Plymouth and the surrounding branch lines and main line over the past week. Here is the glimpse I got of her today and god did she clag when leaving the station! The video will be added to youtube very shortly. Shame they don't use these more often, what a noise these old gals make! Even at 8 in the morning there were still plenty of train spotters out to greet her! One of the last things you'd expect to hold you up on your travels I would think! But anything can happen on the 81C as was proved today when this sheep blocked that road. This was between Tregantle Fort and Antony. 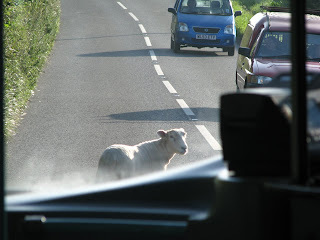 The sheep ran along infront of the bus for around half a mile, with us unable to pass, due to the way it was acting and the amount of traffic coming the other way. It finally did turn up a side road but who knows where it got to after that! Sunday saw myself and a friend take a trip aboard WHOTT's Bristol VR VDV 137S, also known as Victory, when she was being used by Devon General. The day started off at one of the Exeter Park and Ride sites, with 937 (VDV 137S) AEC Relliance 960 HTT, and AEC Regent CTT 518C. John Doige was the driver for the day, and my can he drive a VR! I must say it was an absolutely fantastic thrash along the roads of Devon, and the VR was in fine fettle. I hadn't been on the bus for 2 years, but they've worked some magic on her over at Knowstone, and she is quite a rocket now! The jouney took us from Exeter, along the coast through Starcross and Dawlish etc to end up at Teignmouth. 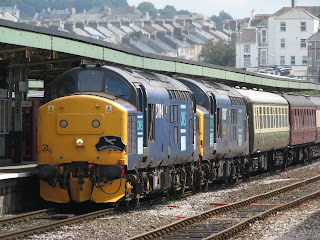 A stop at Teignmouth then took us right down towards Newton Abbot, Torquay, Brixham and Totnes. Then it was inland to Buckfastleigh where we made another stop at the South Devon Railway. After this we proceeded on to Bovey Tracey which would be the final gathering point. I will try to put a video together of the bus in action in the near future. 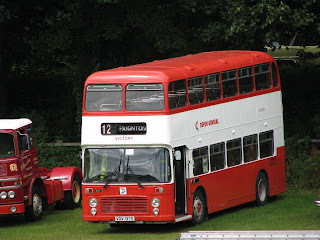 Seen here is Caradon Riviera Tours' Leyland (Tiger?) 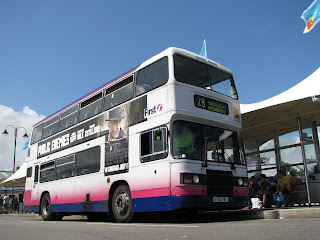 LUI 9955, seen here at the top of Fourlanesend Hill. Its wonderful to still see this 30(ish) year old coach still being used daily, here being used on a private hire trip to Woodland's Adventure Park. She still works hard here and I'm sure will keep pounding on for a long while to come. She did sound and look very healthy, especially for her age, I wish I was one of the lucky people who had had a chance of riding on this yesterday! 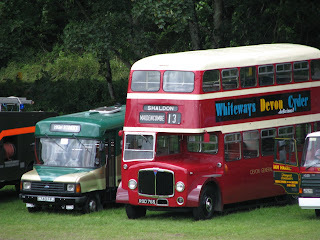 This bus also made an appearence at the Winkleigh Bus Rally last year! 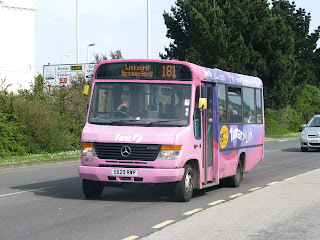 The route currently operated by FDC from Torpoint to Liskeard is the 181. This was started just over a year ago now and has been run by Varios. 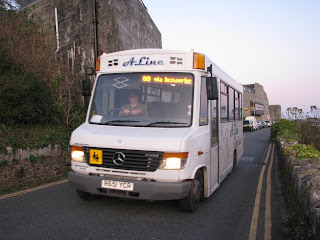 Because of the route structure, this has meant that A-Line Travel opted to change they're route to serve St Germans and Kernow Mill etc instead of the old route via Downderry etc which the 181 serves. Though is has now been announced that 181 will be dropped by FDC and a form has been sent to A-Line Travel to operate the route as '281' if they would like. This is only in the early stages though Jim seems fairly keen on the idea. 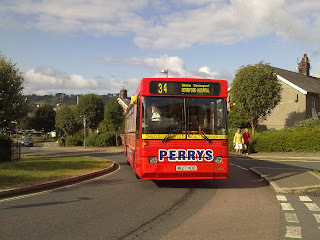 Though to my knowledge 281 is the route that Liskeard and District operate between Crafthole and Polperro. Maybe this will have a number change, but it seems strange to do this when it has been established for a fair amount of time. Maybe it was simply a 'typo' on the piece of paper! This would mean that A-Line would operate on Saturdays for the first time in its history, as that is what the new tender will require. Previously A-Line has only operated buses on Monday to Friday, and this will remain the same for routes 80/A/B. This does also mean that Mercedes 709 M152 LPL might be brought back out again, and seen in service! A-Line will need to either use her, or to purchase a new bus, and seeing as M152 is currently sitting there, without a use, it seems logical to get her back on the road, as said by driver Steve. Will be very interesting to see what happens in the coming months, the tender shall start in September if A-Line is to take the route over! PTOTPA will keep you informed. This picture of he WNPG fleet a new years ago is from Derrick Cuff's compilation. As you can see the 2 series 3 VRs were not part of the fleet at this time, and technically neither is the Bristol Loddekka which was on loan to WNPG to run the herritage service! 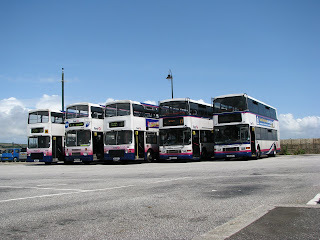 All of these buses have now been forced out of the First Devon and Cornwall depot at The Ride and now take residence in several different locations across Devon and Cornwall, including Loddiswell and Liskeard. The LH VOD 125K is still awaiting a refit to bring her back to former glory, so is currently out of action. The SU is currently serviceable. 1056 OTA 290G has now been re-painted for the new season, though she is still in dry storage because of leaking from the windows. The Loddekka is back with her owner. This picture here from Derrick Cuff is of Torpoint Dennis Trident 32760 when she was brand new and being readied for service at Torpoint! These were revolutionary times as you all know, and as I've said many a time, days that we all miss. It is now funny to think that these have been with us for 5 years now and I thought this was a good opportunity to have a comparison of how they look now. Obviously you can see that the pink is somewhat faded compared to when they were new. 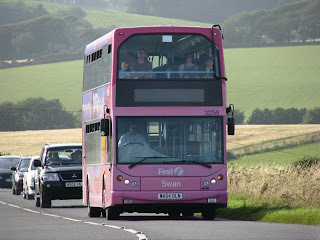 Though it is not shown on this picture they have also lost the yellow bubble that used to be on the nearside top deck. These 2 pictures are of the same bus this being 32760 WA54 OLR. Tridents at Torpoint have also been somewhat unreliable in the last year or 2. Even today I have heard stories of them quite literally falling apart or breaking down in one way or another, and old Olympians having to be sent out to take their place. Personally I have no problem with this, also it adds a bit of drama to it all. But its not really what you would expect of a bus of just 5 years old. They just aren't made like they used to! I pass service 34 every morning on the way to school and this is just a few observations I have made over the months. As i'm sure your aware of the service does have special route branded buses, these being the 3 '56' reg Enviro 200s. 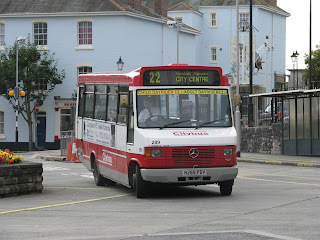 There also used to be a Mercedes 709 which used to operate just infront of the bus to Derriford, which would terminate at Milehouse but this has now ceased as with many of these 'short' services, which were first put in place because of bad timings with the Cremyll Ferry departures and arrivals. Recently punctually on the route has been much improved and this is why only the 1 bus operates on most services now. Though bus types used on the service, at least on the particular one I see do vary. It is now quite normal to see one of the '08' reg Enviros on the 34, and also one of the newer Darts. But today was a little reminder of the past, this being M127 HOD. Step Darts used to be the staple bus for the route, but now obviously have been replaced by the newer vehicles. It was much nicer to see a good strong steppy on there for a change, the sound is just that bit nicer compared to the Enviros! I do wonder why it is a common occurrence to see one of the '56' Enviros on services such as 41/2 though. The buses were funded and bought just for the route, and yet they are often used on other PCB routes. I'm sure the users are not complaining having an even nicer bus on route, though it does seem to destroy the point of having the buses route branded, as in many cases nowadays. 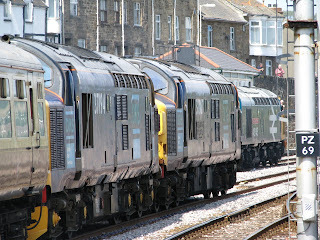 Today, as Torpoint will soon start another chapter in the depot's life, I post these pictures very kindly from Mr Derrick Cuff taken back when Torpoint was near totally VR operated. 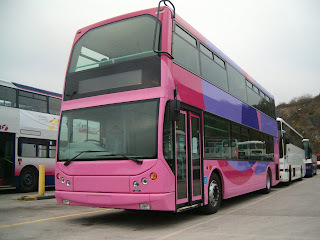 First picture is of the Welsh VR BEP 966V. 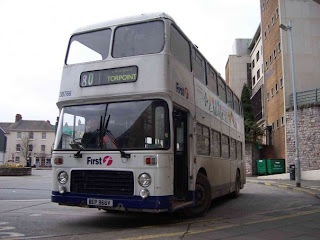 She was new to the South Wales Transport company and was then the last VR moved to Torpoint in 1990. Tony Body at the wheel here, seen in Bretonside on old route 80! 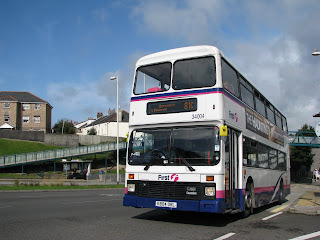 Also remanisiant of the times when buses ran through Devonport, right past my school. When I first joined the school a couple of the VRs still did this route and I used to love spending lunch times looking out for them if and when they came past. Yes even in 2005 I have VR memories which I can tell! 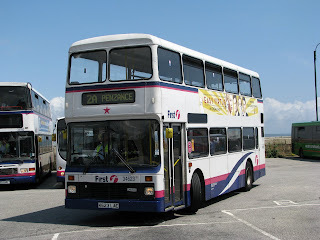 Secondly is of LFJ 843W new to Western National, and was amonsgst the longest serving of the VRs at Torpoint. Again seen here with Tony Body! And you can see by the smile on his face that times were great!! The whole K reg batch of Volvo Olympians are now in the area and I'm sure it won't be long til the last 2 C reg Olympians are replaced. The last reminder of the Gardner era is nearly at an end. 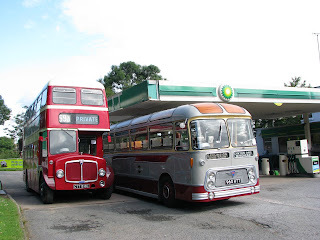 A feature I may start to include on the blog is of interesting stories that I here on the buses from drivers, and my god they do say some fascinating things once in a while. To kick of the series is Steve of A-Lines story of when he used to work at People's Provincial in Gosport, driving a whole fleet of Leyland Nationals. He's said that he hated driving these and thats what made him move later on to work at Southdown in Portsmouth. Though he recalls one time when he was sitting in a traffic queue at the lights in the town centre of Gosport, driving a particularly clapped out National. A convertible car pulled up towards the back of the bus, with 2 young, beech blond birds (girls) in. As the lights changed, the young Steve however much he dreaded it, put pedal to the metal, and the National billowed out black smoke all over the car, and into the girl's faces, he said that looking back in his rear view mirror he couldn't even see the car, dowsed by the fumes from the National. And as they went past, Steve got a very powerful look from the 2 girls! ... well was! A-Line Travel R651 YCR also known as Bertie returned to the road yesterday after around a week out of service, with new injectors now fitted. She was running the best I've seen her ever run and even started on the button, though her alturnator has now packed up and is again out of service, meaning X891 YGU (the only bus not yet named) takes over the 80s while the Transit runs X891's school duty. Hopefully she will return to the road soon. so anyone got any ideas for X891 YGU?